Ok, the title is a wee misleading. But hear me out. When I had kids all of my idiosyncrasies really kicked in- worrying, anxiety, and perfectionism. I've been on a journey of self reflection and personal development for a few years now when I really realized just how much these idiosyncrasies were impacting my life. And not in a great way. You can check those posts out here.. and here. Oh, and here too. The last year has been the year I've experienced more growth and change than ever. I am in a constant evolution though and feel nowhere where I would like to be but then again, will I ever? I've always felt that motherhood and life is a constant series of figuring yourself out, finding yourself, readjusting and doing it all over again. Back to the title. I realize it says "the year I didn't take my kids to see Santa or Easter Bunny," and that's not entirely true. I did, in fact, take them to see both, in a sense. Let me explain. In the past years, going to see Santa or Easter Bunny were BIG deals. I planned outfits, hair bows and shoes. I made sure that we went to see Santa or the Easter Bunny ahead of the actual holiday and made sure my Nikon was ready. This year and probably even last year- not so much. We happened to be at the mall this December and on a whim decided to let the girls sit on Santa's lap- and NOT in coordinated clothes and bows- OH the horror! And I didn't even worry about making sure Will got the perfect picture, either. It was solely for the girls to talk with Santa (or in Saidey's case- hide in my shoulder)- and my opportunity to view the magic of the holidays through a 5 and 2 year old's eyes. And this year- we saw the Easter Bunny last minute at Will's work. It dawned on me a week before Easter that we didn't do the obligatory Easter Bunny visit at the mall. I had a flash of guilt and then moved on with life. 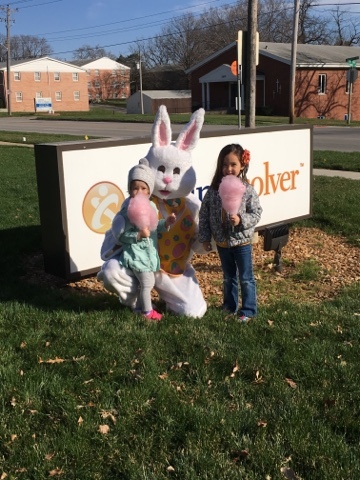 We did get a picture with the Easter Bunny... and cotton candy as big as their heads. This might not seem like a big deal to some of you but for me, it shows how I'm finally listening to my own advice. Not sweating the small things. That it's ok to not document every holiday with the obligatory sitting on the lap of a bearded man or oversized, actually scary bunny. That it's simply all ok and the world doesn't stop spinning if your kid's outfit doesn't match. The "skeleton" at the park. The day the girls declared it to be PJ day! I have let go of the idea that my kids will look perfect at all times. Dealing with a VERY opinionated 3 year old has helped me move past that idea. So much in fact that I've let her wear PJ's to daycare (and NOT on PJ day, mind you), and if she wants a braid off the top of her head because she wants to look like Elsa, darn it, I let her. I still have some progress to make in this category because Sophia doesn't mind when I pick out her clothes, usually. So, during the week, I mostly pick out options and then she picks from those. But on the weekends, I do let her pick out her own clothes which is progress for me.